Conquer any heights with the 3-in-1 Emergency Solar Flashlight with Radio and Cellphone Charger! 3 Energy Sources – This emergency solar flashlight can be charged through solar, kinetic (hand cranking), and electrical charging. Multi-purpose – This solar-powered technology is your 3-in-1 emergency kit. 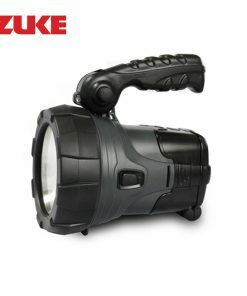 It’s a flashlight, a radio, and a cellphone charger, all in one pocket-sized item. Comes in a waterproof case – Hike and trek on any weather and still feel secure with this 3-in-1 emergency kit. 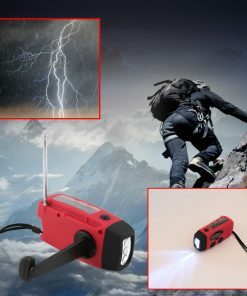 Let the 3-in-1 Emergency Solar Flashlight with Radio and Cellphone Charger bring you to further heights! With multiple ways to recharge (solar, kinetic/hand cranking, electrical), it will surely save you in any situation. To reiterate, a minute of hand cranking can provide over 5 minutes of radio play time, 30 minutes of continuous torch light, and 5 minutes of cellphone talk time. What’s more? The 3-in-1 emergency solar flashlight comes in a waterproof case and is very compact and easy to carry.